This entry was posted on October 24, 2016 by brandonbabbitt, in News. Bookmark the permalink. Querencia Community Bike Shop (QCBS) is currently seeking a vacant workspace to rent before December 15, 2016. The reason for our message is to reach out to the community for recommendations of available workspaces or people who may know of possible locations for QCBS. 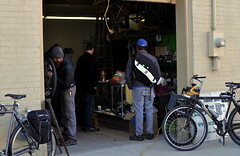 QCBS is a non-profit bike shop located at 420 S. Bell (behind SCRAP). We have been a part of the Denton community for almost 10 years, and since then we have helped individuals across all socio-economic statuses, ages, and professions (i.e. college students to people who have established careers) become more familiar with cycling as a method of transportation and leisure. We assist and teach people how to fix their bicycles and offer used bicycles and parts in exchange for small monetary donations. 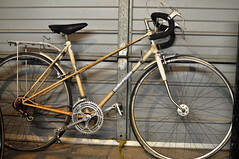 The inventory we currently have is mostly from donations of Denton residents and the local commercial bicycle shops. QBCS also participates in community functions, bike maintenance workshops, bike maintenance services at community events, donations of refurbished bicycles to other community organizations, promoting cycling as a means of transportation for those in need, and other local functions as volunteers. We would not have been able to do this without the support of the Denton community, providing us a home to call our own. In the past, QCBS has changed its locations several times since our inception but has continued to provide services while facilitating the growing community here in Denton. QCBS is currently in a location that is easily accessible to cyclists and pedestrian, just off of downtown and within walking distance of public transportation. 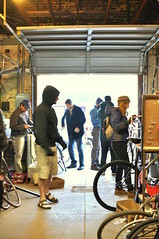 Although the current space is limited in size, it can accommodate several people working on their bicycles at a time. Some of the tools and equipment also require the use of electricity. Thus a few things a possible workspace may need include running electricity, easy, safe access for cyclists, enough space (we are currently operating with ~450 sq.ft. ), and have a budget of $500-$800/mo. We know this request seems impossible, but previously, we have been incredibly lucky to be offered unused space with other organizations with whom we have partnered. For a few years, we operated in the backyard of Rubber Gloves, and the past four years, we have had the incredible partnership with SCRAP, working out of their unused garage. Ideally, a similar arrangement would be the most beneficial. A local company or business who wants to see continued progress for the cycling community in Denton, willing to offer an unused loading dock or garage space. If you would like to get more information, feel free to visit us during our current hours (Mons 4-8pm, Weds 4-8pm, Sats 2-6pm), email us at info@qcbs.org. We also have an upcoming council meeting on October 24, 2016, at 7 pm at 420 S. Bell, Denton, TX. We look forward to hearing from members of the Denton community.